I don't think there's much dispute that the many "imprints" under the Author Solutions umbrella are among the most negatively regarded of all the author services companies. From the predatory business practices that gave rise to two class action lawsuits, to the huge number of customer complaints, to the relentless sales calls and deceptive recruitment methods, to the dubious and overpriced "marketing" services that are one of the company's main profit sources, AS's poor reputation is widely known. Along with other factors, such as the competition from free and low-cost self-publishing platforms, this has pushed AS in recent years into steady decline. On the surface, the clones don't look that different from other, not necessarily disreputable author services companies offering publishing packages and marketing add-ons. However, they share a distinctive cluster of characteristics that can help you identify them. 1. Solicitation. Like the Author Solutions imprints, the clones are big on out-of-the-blue phone calls and emails hawking their services. Often they'll claim your book has been recommended to them, or discovered by one of their book scouts. The phone solicitors frequently have foreign accents (many are based in the Philippines). The email solicitors use a recurring set of job titles: book scout, literary agent, Senior Marketing & Publishing Consultant (or Senior Publishing & Marketing Consultant), Executive Marketing Consultant. 2. Offers to re-publish authors' books. A big focus for the clones is poaching authors who are already published or self-published (often with Author Solutions imprints). They claim they can do a better job, or provide greater credibility, or even get authors in front of traditional publishers. 3. Elaborate claims of skills and experience that don't check out. A clone may say it's been in business since 2006 or 2008, even though its domain name was registered only last year. It may claim to be staffed by publishing and marketing experts with years or even decades of "combined experience", but provide no names or bios to enable you to verify this. A hallmark of the clones' "About Us" pages is a serious lack of "about." 5. Junk marketing. Press releases. Paid book review packages. Book fair exhibits. Ingram catalog listings. Hollywood book-to-screen packages. These and more are junk marketing--PR services of dubious value and effectiveness that are cheap to provide but can be sold at a huge profit. It's an insanely lucrative aspect of the author-fleecing biz, not just because of the enormous markup, but because while you can only sell a publishing package once, you can sell marketing multiple times. This is a page right out of the Author Solutions playbook. AS basically invented junk book marketing, and most of the marketing services offered by the clones were pioneered by AS. If you follow the links below, you'll see the same ones over and over, and if you hop on over to an AS imprint marketing section, you'll see them there, too. Authors are often serially targeted by the clones. For instance, I heard from an iUniverse-published author who bought an expensive re-publication package from Book-Art Press Solutions, and shortly afterward was solicited for marketing services by Stratton Press (fortunately she contacted me before she wrote a check). Another author bought a publishing package from BookVenture, plus extra marketing from Window Press Club--both as a result of solicitation phone calls. Below are the clones I've identified to date (several of which I found in the process of researching this post--I actually had to stop following links or I'd never have gotten this written). The list includes a few that, based on their websites and other public information, I suspect are clones but haven't yet been able to document with complaints or solicitation materials. One thing you'll notice if you follow the links is how similar the clones' websites are. It's not just the characteristics mentioned above: the same terminology, menus, and products appear over and over again, as do distinctive English-language errors (many of the clones urge authors to "avail" of services, for instance). Also, of the 13 companies I looked at, ten are less than two years old, and seven started up in the past year. It really made me wonder, especially after I discovered that two apparently separate clones are in fact the same outfit, and two others appear to be connected. I have no doubt there are many more clones out there. If you've encountered any I haven't listed below--or if you've had an experience with the ones featured in this post--please post a comment. LitFire Publishing is the first Author Solutions clone I ever encountered, and the one that alerted me to the phenomenon. My 2014 blog post takes a detailed look at its false or unverifiable claims, its illiterate solicitation emails, its plagiarism (it's still doing that), and its Philippine/Author Solutions origins (its phone solicitors sometimes claim AS imprints are "sister companies"). See the comments for many reports of solicitation phone calls. LitFire is a good deal more sophisticated now than it was in 2014, with a flashy website from which the English-language errors that marred it in the beginning have largely (though not entirely; its blog posts could use some help) been culled. But it's still a solicitation monster, and its Author Solutions-style publishing and marketing services are still a major ripoff. Take a look at its insanely marked-up Kirkus Indie review package (you can buy reviews directly from Kirkus for less than half the price). In 2018, perhaps to escape mounting complaints or maybe just to establish new revenue streams, LitFire started doing business under two new names: Amelia Book Company and Amelia Publishing. LitFire claims it's headquartered in Atlanta, Georgia, and it is actually registered with the Georgia Corporations Division. Possibly to get ahead of negative discussion, it has admitted--partially--its Philippine connections. It's also aware of my warnings about it, and has responded with some fairly incompetent trolling. Legaia Books is also a solicitation monster. It heavily targeted authors of Tate Publishing right after that disgraced vanity publisher collapsed. Legaia offers publishing packages, but its main schtick is Paperclips Magazine, an online rag that consists primarily of ads, reviews, and interviews sold to authors at gobsmackingly enormous prices, interspersed with plagiarized general interest articles and illiterate feature pieces written by Legaia's English-challenged staff. Legaia's website is full of howlingly funny (or cringingly awful, depending on your perspective) English-language mistakes. Keeping to its penchant for plagiarism, and incidentally acknowledging its roots, it has copied much of its FAQ from Author Solutions. My blog post on Legaia goes into much more detail. Like other members of clone club, Legaia claims to be headquartered in the USA, with a street address in Raleigh, North Carolina. But there's no trace of any North Carolina business registration. When the Better Business Bureau attempted to contact it by paper mail, the mail was returned by the post office. Stratton Press claims to offer "an experience that is one of a kind for both novice and veteran authors". Oddly, it doesn't display its publishing packages on its website; you have to go to its Facebook page to see them. Named after famous writers, they start at $1,800 and go all the way up to $10,500. The website is replete with vague claims ("our team's eight-year experience in the publishing industry), shaky English ("Since every book is unique and every story is special, it is just but right to have a team of experts behind your back. "), and plagiarism (here's "How to Write a Novel" by Chuck Sambuchino of Writer's Digest. Here's "How to Write a Novel" by "Chuck Subchino" of Stratton). Stratton is the one of the only clones I found that doesn't actively try to conceal its Philippine/Author Solutions roots. A Cebu City address also appears on its Contact page; and per his LinkedIn page, Stratton's co-owner, Aaron Dancel, worked for three years as a Sales Supervisor for Author Solutions' Cebu call center. UPDATE 12/14/18: Stratton seems to be having some trouble paying taxes on time. UPDATE 1/17/19: Stratton Press LLC has been administratively dissolved in Wyoming for tax delinquency. Not to worry: planning ahead, Stratton Press Inc. was incorporated in Delaware in June 2018, and has switched its US address to Wilmington, DE. ReadersMagnet describes itself as "a team of self-publishing and digital marketing experts with more than 10 years of combined experience". Its motto: "Your Success is Our Delight!" So is your money. You can pay as much as $29,999 for a Premium Color Adult Book publishing package. On the junk marketing side, you can shell out $6,299 for an Online Brand Publicity campaign, or $2,799 for a Premium Dynamic Website, or $4,999 for a 90-second Cinematic Deluxe video book trailer. In true clone style, ReadersMagnet is a tireless and prolific phone solicitor (hence the many complaints that can be found about it online). I've heard from many authors who have been repeatedly called and/or emailed by this outfit; one author told me that she got so annoyed that she blocked the caller's New York number, only to be contacted a couple of days later by another ReadersMagnet solicitor, this time with a California number. Writers have also told me that callers have foreign accents and Spanish surnames. A search on LinkedIn turns up two Philippines-based ReadersMagnet staffers. Oh, and ReadersMagnet apparently had a lovely Christmas party last year...in Cebu. ReadersMagnet's current website reads okay, with occasional lapses. But its original website, which came online in mid-2016, was full of howlers. Compare this early version of its About Us page (courtesy of the Internet Archive) with the current iteration, which isn't high literature but at least is more or less grammatical. The company hasn't worked as hard to clean up its correspondence. Here's a snippet from a recent solicitation email--it's really kind of a masterpiece. ReadersMagnet originally claimed a New York address. Now it says it's located in California. As far as I can tell, it has no business registration in either state. Toplink Publishing bills itself as "the global leader in accessible and strategic publishing and marketing solutions". It boasts every one of the warning signs identified above: Solicitation. Re-publishing offers. Unverifiable claims about staff and experience. Tortured English. Lots and lots of marketing. Toplink's publishing packages are categorized a la Author Solutions (black and white, full color, children's book, etc. ), and neither they nor the marketing packages provide any prices; you have to call to find out. Hard-sell sales tactics work better on the phone. Also, no prices on an author services company's website is nearly always a giant clue that they're super-expensive. Here's the marketing proposal one author received--note how Toplink wants the author to believe that the ridiculous amount of money he's being asked to pay for his "compensation share" is more than matched by Toplink's "investment" (a classic vanity publisher ploy). Toplink claims addresses in North Carolina and Nevada, but there are no business registrations for it in either state. A number of complaints about it can be found online, including at its Facebook page. It also has an F rating from the BBB, based on its failure to respond to consumer complaints. UPDATE 4/5/19: Toplink's website appears to be gone, possibly as a result of proliferating complaints at the BBB and elsewhere. Its Facebook page is still extant, but that doesn't mean much--there've been no posts for nearly a year. Book-Art Press Solutions (not to be confused with the graphic design company of the same name, or with Book Arts Press) and Window Press Club present as different companies, but in fact they're two faces of the same ripoff. My recent blog post about this two-headed beast goes into more detail, including the identical website content that gives them away. Book-Art Press employs an exceptionally deceptive approach to authors, portraying itself not as a self-publishing provider but as a group of "literary agents" who want to re-publish authors' books in order to give them the "credibility" needed to "endorse" them to traditional publishers. The cost? Only $3,500! Authors are encouraged to believe is all they'll have to pay. In fact, as with all the clones, the initial fee is just a way to open the door to more selling. BAP/WPC is a pretty recent venture, with domain names registered just last year. BAP claims it's in New York City, although its business registration is in Delaware. WPC doesn't provide a mailing address, but its domain is registered to Paul Jorge Ponce in Cebu, Philippines. Here's one of BAP's solicitation emails, reproduced in its entirety. It really tells you everything you need to know. Westwood Books Publishing, which claims a Los Angeles location, registered its domain name in March 2018. To confuse matters further, Westwood/Greenberry also appears to have recently started doing business as Authors Press. A few examples of the links between these three entities: a book listed as both Greenberry and Westwood; a book listed with all three companies; also, as of this writing, nearly every book listed at Authors Press shows on Amazon as published by Greenberry. Greenberry/Westwood/Authors Press's M.O. is clone-standard. Out-of-the-blue solicitations (also see the comments, below). No names, vague claims (and check out Westwood's hilarious, unlinked About Us page). Shaky English ("ideal for manuscripts that needs more work on sentences structure and grammar"). Re-publishing offers (see the Greenberry solicitation below, which I'm reproducing because I think it's so funny; what genius, looking for an enticing photo of a published book, thought it was a good idea to pick one in Cyrillic?). Budget-busting junk marketing. Greenberry's business registration shows a Pittsburg CA address, and lists its owners as Maribelle Birao and Aaron Gochuico. Birao and Gochuico now appear to reside in California but are originally from Cebu. Westwood's business registration, filed in April 2018, claims a Los Angeles address and does not list owners' names. Authors Press doesn't appear to have filed a registration yet, but according to its website is located in--surprise!--Pittsburg CA. There's some evidence that yet another company is running under the same roof: Book Vine Press. Testimonials on Book Vine's website extol the wonderfulness of the authors' publishing experience--but on further investigation, the authors turn out to be published not by Book Vine, but by Greenberry. And Book Vine's book fair display packages are identical to those offered by Authors Press. BookVenture started up around the same time as LitFire, in 2014. It's got all the identifying characteristics of a clone: phone solicitations, no meaningful information about the company or its staff, a range of Author Solutions-style publishing packages with goofy names, a dizzying array of marketing, publicity, and add-on services. Equally predictably, these are seriously overpriced: $2,399 for a Kirkus Indie review, which would cost a mere $575 if you bought it from Kirkus; $199 for US copyright registration ($35 if you DIY); $4,199 for a half-page magazine ad that actually costs $1,400. See also this angry blog post from Self-Publishing Review, which discovered in 2016 that BookVenture was offering its review services without permission and at steeply inflated prices. BV's website doesn't display the same level of English-language lapses that are a giveaway for other clones--but someone should have done a better job of vetting its Publishing Guide. 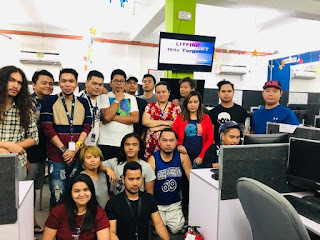 Like other clones, BV claims a US location--Michigan, to be precise--but a search on LinkedIn turns up a lot of Philippines-based staff (who in some cases are Author Solutions alumni/ae). Although BV doesn't acknowledge its parentage, I've gathered enough breadcrumbs to be certain that it is owned by eFox Solutions Inc. (formerly Yen Chen Support Corporation), which is registered in Wisconsin (where it's listed as "delinquent), but is actually based in Mandaue City, Philippines. eFox also owns notorious book marketing spammer BookWhirl, which in terms of hard-sell solicitation tactics and overpriced junk marketing services has been giving Author Solutions a run for its money since at least 2008. BV has racked up quite a number of complaints about quality, timeliness, and customer service. The one complaint I've received about this company is very similar. I've also received reports of telephone solicitations (BookWhirl is infamous for phone soliciting). Check out BV's referral program--you can earn $150! Also its several Author Solutions-style shill sites, which pretend to be independent but are actually author recruiting tools. If you're a glutton for punishment, you can read one of BookVenture's extremely deceptive (not to mention wordy) sales pitches here. Okir Publishing says it started out as "a marketing services provider" in 2006, and transitioned to book publishing later--but according to its Wyoming incorporation data, its initial filing was just last September, and its domain was registered in October 2017 (to add to the confusion, its Terms of Service are governed by California laws). UPDATE 1/18/19: Okir is accumulating complaints. There are several at the BBB, and more at PissedConsumer. "Are your [sic] ready to publish your book?" asks ADbook Press. "Grab this once in a lifetime oppurtunity [sic] and get yourself started by availing of the package and service that is a bang for your buck." Registered in Nevada but claiming to be based in California, ADbook sports all the clone signs and signals. Its publishing packages carry no prices (and you know what that means). It offers a full complement of junk marketing, including the Author Solutions favorite, the Hollywood Book to Screen package. In fact, ADbook's Hollywood package is an exact duplicate of Author Solutions'. UPDATE 10/25/18: ADbook Press's URL appears to be dead, and it hasn't published anything since September (hence the archived links above). "Let's Get Brewing Today" says Coffee Press. Purportedly located in New York, Coffee Press has its English pretty much under control, but other clonesigns tell the story: solicitation, unverifiable experience claims ("visionaries with over a decade of publishing expertise"), and the usual menu of junk marketing "starting at $2,499." 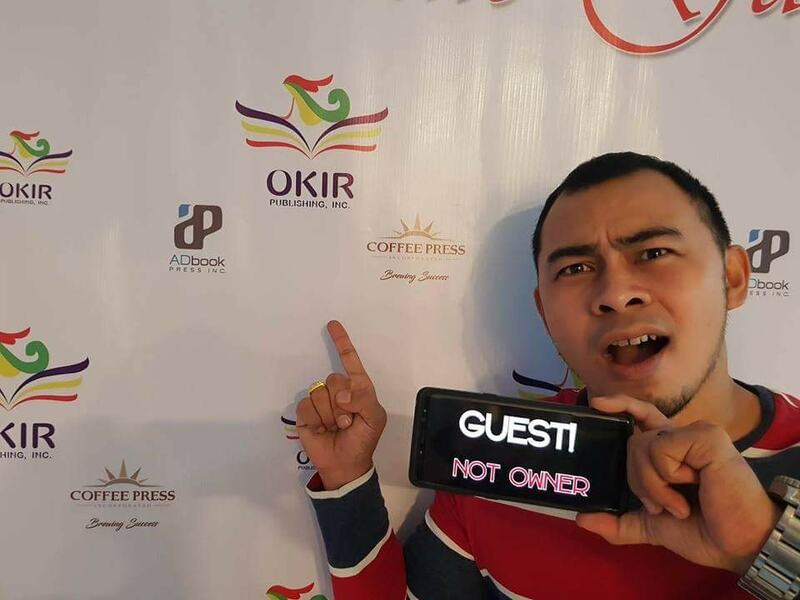 And that's not all to suggest that Okir Publishing and Coffee Press--and ADbook Press as well--are good buddies. Check out the logos in the background of the photo below. I strongly suspect that many other clones are similarly interrelated. Zeta Publishing is incorporated in Florida. English-language errors are apparent throughout its website, and the About Us page includes the usual non-information. There's a full raft of Author Solutions-style marketing and add-on services, all insanely marked up. You can get your copyright registered for $189 (or do it yourself online for $35). You can pay $4,150 for a half-page ad in Bookmarks Magazine (or you can contact Bookmarks yourself and buy the ad for $1,400). You can also buy a 10-minute radio interview with internet radio personality Stu Taylor, who just happens to be Author Solutions' favorite radio talk show host. Clonesign is there as well at Everlastale Publishing: no concrete info about the company or staff, whimsically-named Author Solutions-style publishing packages, the familiar range of overpriced junk marketing services. Everlastale's President, Don Harold, is an alumnus of BookVenture/BookWhirl, and Everlastale's publishing agreement has been substantially copied from BookVenture's. It's a revealing demonstration of how these predatory companies seed imitators. UPDATE 6/14/18: Everlastale is now defunct. UPDATE 12/31/18: I've identified more than 20 additional clones. 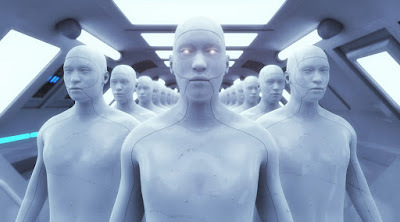 See my followup post: Army of Clones, Part 2: Twenty-One (More) Publishing and Marketing "Services" to Beware Of. I've also added a complete list of the clones I've discovered to date to the sidebar. NOTE: Book-Art Press and Window Press Club are aware of this post, and have made changes to their websites, so some of the links below may not work--however, all were fully verified by me at the time of writing. I'm getting a lot of questions from authors who've been solicited by an Author Solutions-style author services company called Book-Art Press Solutions. Book-Art Press's website dangles the carrot of free publishing ("Why spend thousands when you can publish your book for free? "), but this is less a yummy vegetable than a poison pill. BAP's publishing packages are really just a way to steer writers toward a smorgasbord of junk marketing services (book trailers, paid review packages, press releases), questionable editing services ("A thorough editing...is applied for the material to be professional written, yet retaining the author’s voice"), and add-on services of dubious value (illustrations, data entry, and more). BAP's website is full of questionable grammar and syntax ("What the authors feel and assured of is the press club’s transparent journey and reliable sources of publishing channels in every step of the way"), which should be a major red flag all on its own. Also, there are no prices anywhere on the site; you have to call to get that info. This is nearly always a big clue that the fees are huge; plus, forcing people to get on the phone is a classic hard-sell sales tactic. It's a lot easier to hook victims if you can talk to them directly. We are not a self-publishing company. We work as a literary agency that will endorse your book to be acquired by a traditional publishing company. We have inside contacts with major publishers and we know which of them are most likely to buy a particular material. So you won’t need to hire literary agents to promote your book to major publishers as we’ll do the endorsement for you. We have done a preliminary endorsement to 50 traditional publishers and 6 out of the 50 have shown high interest in your book. However, they’re quite hesitant since your book is self-published and it has not been doing well when it comes to sales. We have made a strategic plan for your book. Before we can endorse your book to traditional publishers, we will need to build your book’s credibility and your brand as an author. Because, as of now, you are still an unknown author. We can’t afford any flaws once we endorse your book. To take advantage of this amazing deal, all authors have to do is agree to pay for "at least 500 copies of your book (priced at $6 per book -- $3,000 total) to be distributed to physical bookstores across the globe for circulation". With a self-publishing company, your book’s success depends on how much money you are capable of investing; which almost all self-published authors are unaware of how this delays the success of your book. Delaying your success is more practical for their business. Because, the longer your success is delayed, the more services they can sell to you. Your pocket will be exhausted until it becomes empty because that’s how they earn as a business and how sales agents get commission from-- the more services they are able to sell, the bigger commission they get. And eventually you get exhausted as well and so you get discouraged to move forward because you have invested so much effort, time and large amount of money and you haven’t seen any progress with your book yet. Which probably what you feel now. And that’s the worst thing that can happen to an author -- despair. Your book is too great to be left sitting online among millions of books available in Amazon. It’s like a grain in a bucket of sand. Almost impossible to be noticed. Our goal for your book is to make its success faster and that’s by directly endorsing your book to executives so you can land a contract with a traditional publisher. It's all lies, of course. There will be no 500-copy print run. No brick-and-mortar bookstores will be approached. No publishers will be pitched. Instead, once authors have ponied up the initial $3,000, BAP will do exactly what it pretends is not its business model: solicit writers to "invest" even more money in additional marketing services. This heartbreaking video from an author who was scammed by Book-Art Press to the tune of over $7,000 provides a window into the disgraceful lies and sleazy tactics this company employs to rip off writers. ...and here's the exact same text on BAP's home page. There's plenty of other stuff that's identical, from the About pages to the marketing product descriptions to the "free publishing" promise and the absence of prices. So did BAP plagiarize WPC? WPC's domain registration precedes BAP's (though both were registered just last year), and at first that's what I thought. But...they have the same phone number (though this appears to be an oversight, since a different number appears on BAP's Contact page). They filed the same press release for the same book on the same day last November. There's also this: a pitch for WPC that was once on BAP's website. It's been de-linked, but is still Google-able. Oops. So it's pretty clear what's going on. WPC and BAP are one operation, posing as different companies in order to maximize their customer base. BAP and WPC's domain registrations are both anonymized, but WPC's wasn't always. 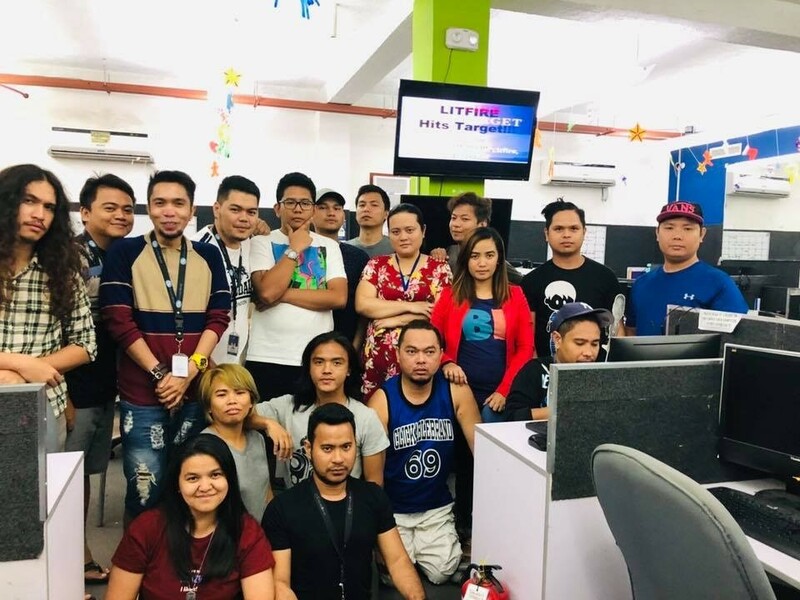 Originally, it was registered to Paul Jorge Ponce from Cebu City, Philippines, where the Author Solutions call centers are located. Always, always beware of phone or email solicitors promising gifts. UPDATE 1/25/18: Book-Art Press/Window Press Club is one of a growing number of similar companies that appear to be Author Solutions imitators, staffed and, in many cases, started up by ex-Author Solutions call center employees in the Philippines. UPDATE 1/5/19: Book-Art Press has re-vamped its website, and the identical homepage content mentioned above has been removed (it's still present on Window Press Club's website). But it's still English-challenged ("Book Art Press unlocks your book’s real potentials by being steps away from the common trend, usual steps, and stale platforms"), and the pitch (claiming they can leverage traditional publishing contracts) remains the same. If anything, the lies have been expanded, with claims of "strong connections" with traditional publishing houses, and partnerships with "several film-makers, producers, and studio executives" (un-named, of course). Here's one of BAP's latest offers. Note the pretense that BAP is investing its own substantial resources, supposedly far exceeding the author's "investment". This is a classic vanity publisher ploy. The Science Fiction and Fantasy Writers of America has issued an alert on copyright infringement by the Internet Archive. Other professional writers' groups taking notice include the UK's Society of Authors, which has posted an alert on its website, and the USA's Authors Guild and National Writers Union, which have alerted their members. I've reproduced SFWA's alert below. Although this seems to be the first time widespread attention has been paid to it, IA's massive scanning project is not a new endeavor. See this 2013 article from Teleread's Chris Meadows. I've commented on my own experience at the bottom of this post. The Internet Archive is carrying out a very large and growing program of scanning entire books and posting them on the public Internet. It is calling this project "Open Library", but it is SFWA's understanding that this is not library lending, but direct infringement of authors' copyrights. We suspect that this is the world's largest ongoing project of unremunerated digital distribution of entire in-copyright books. An extensive, random assortment of books is available for e-lending—that is the “borrowing” of a digital (scanned) copy. For those books that can be “borrowed,” Open Library allows users to download digital copies in a variety of formats to read using standard e-reader software. Unlike e-lending from a regular library, Open Library is not serving up licensed, paid-for copies, but their own scans. As with other e-lending services, the books are DRM-protected, and should become unreadable after the “loan” period. However, an unreadable copy of the book is saved on users’ devices (iPads, e-readers, computers, etc.) and can be made readable by stripping DRM protection. SFWA is still investigating the extent to which these downloadable copies can be pirated. These books are accessible from both archive.org and openlibrary.org. If you want to find out if your books are being infringed, go to Internet Archive's search page and search metadata for your name. You have to register, log in, and "borrow" the books to see if they are there in their entirety. A secondary search on Open Library's search page may turn up some additional titles, but will also show books that are in the Open Library database that have not been infringed. If you believe that your copyright has been violated by material available through the Internet Archive, you can provide the Internet Archive Copyright Agent with a Digital Millennium Copyright Act takedown notice. Alternatively, you can use the SFWA DMCA Notice Generator to create a DMCA notice for you. As a temporary measure, authors can also repeatedly "check out" their books to keep them from being "borrowed" by others. • Your electronic or physical signature. Here's my personal experience with the Internet Archive and Open Library. Four of my books have been scanned and are available for borrowing. All four are in copyright, "in print", and available for purchase in digital, print, and/or audio formats. When you borrow a book from IA or Open Library, you can either read a photographic scan of it on-screen via the Internet Archive BookReader, or download it as an EPUB or PDF. The "borrows" are said to expire after 14 days. On January 1, to test all of this, I borrowed and downloaded Passion Blue. The PDF is the photographic scan rendered page by page (rather than double-paged, as in the on-screen reader). The EPUB is an OCR conversion and is full of errors--weird characters, garbled words, page headers and footers in the text, and the like. I also sent a DMCA notice for Passion Blue. I emailed the notice on January 1, and a second notice on January 9. As of this writing (January 11), I've received no response. I'll update this post as I get more info. UPDATE 1/25/18: Internet Archive's Brewster Kahle has responded--sort of--to the controversy, offering what Nate Hoffelder at The Digital Reader dubs a "good works" defense. According to Kahle, the IA's mission is to preserve books "for the long term". It's digitizing books "mostly from the 20th century" that "are largely not available either physically or digitally" including "many...books that libraries believe to be of historical importance such that they do not want to throw them away, but are not worth keeping on their physical shelves". For creators who object, there's "a well known 'Notice and Takedown' procedure....The Internet Archive takes prompt action and follows the procedure, generally resulting in the work being taken down." Kahle does not address the IA's scanning of 21st century books that are in-print and commercially available. According to a recent update from the Authors Guild, feedback from members and authors' groups has "confirmed that a massive number of in-copyright books, some quite recent, are available in Open Library, as well as through the Internet Archive itself." As for that well-known takedown procedure and the IA's "prompt action" in response...I have still not received any reply to my two DMCA notices, the first of which was sent nearly a month ago.